Note: NTSC format. This laserdisc was released only in Hong Kong. It is December 31st, 1999. But will the World survive to see the 21st Century? Deep in the heart of San Francisco's Chinatown, a young boy is about to lose his life in a hail of bullets. But the gunfire finds a different target — a stranger who steps out of a British Police Box. Dr Grace Holloway does all she can but cannot save him or understand the mysteries that surround him. Who is this unknown traveller with two hearts? Why has his body disappeared? 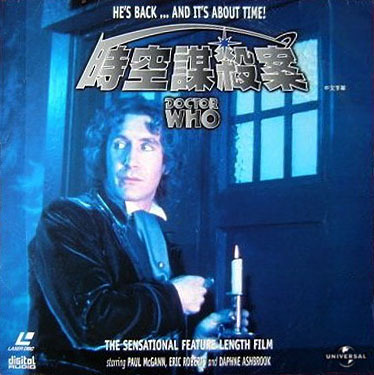 And who is the 'madman' who appeals for her help; claiming to be both the dead man and a time traveller known only as the Doctor? Elsewhere in San Francisco, another time traveller is on the verge of death. For the Master, the Doctor's oldest adversary, survival entails taking over the Doctor's newly-regenerated body. Meddling with the heart of the Doctor's Tardis, he condemns the Earth to destruction at the stroke of midnight, December 31st.